This is a guest blog post written by Gyula Fóra and Mattias Andersson from King.com. The original post can be found on the King Tech Blog. This blogpost introduces RBEA (Rule-Based Event Aggregator), the scalable real-time analytics platform developed by King's Streaming Platform team. This new platform opens the doors to the world of stream analytics for our data scientists across the company. 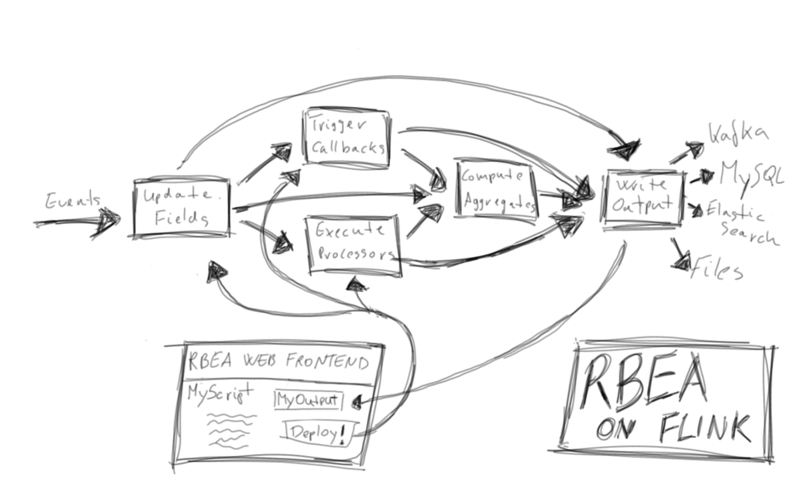 Here, we will describe what motivated us to build RBEA, how the system works, and how it is implemented on Apache Flink™. King is a leading interactive entertainment company for the mobile world, with people all around the world playing one or more of our games. We offer games in over 200 countries and regions with franchises including Candy Crush, Farm Heroes, Pet Rescue, and Bubble Witch. 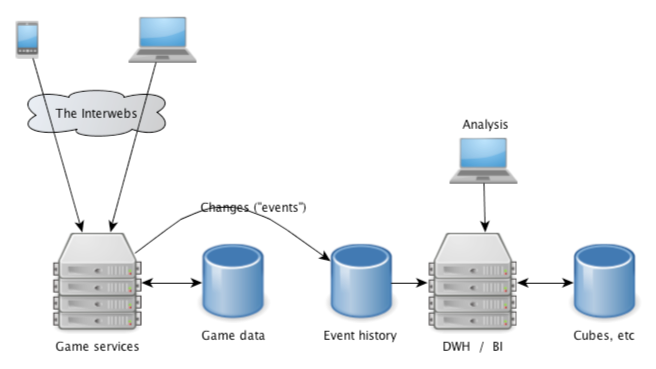 With over 300 million monthly unique users and over 30 billion events received every day from the different games and systems, any stream analytics use-case becomes a real technical challenge. It is crucial for our business to develop tools for our data analysts that can handle these massive data streams while keeping maximal flexibility for their applications. We have already been using different stream processing technologies for several years to handle processing tasks on the live event streams, but until now complex stream analytics has only been in the toolbox of the software engineers, and an uncharted territory for the data scientists. Incoming events are stored in Kafka and are also written to files in HDFS. In our Hadoop cluster each event is mapped to a Hive table which makes it really easy to compute aggregates over the data and also do more complex batch analysis. A subset of the data is also loaded to an Exasol cluster for faster ad hoc querying and better support for complex SQL. We also compute real-time aggregates over the events using an in-house product called Nuevo, which aggregates data from all the Kafka streams into MySQL and provides a data source for release monitoring and real-time dashboards across King. Ask a game developer to add the context we want in game, such as placement, and relational key. Select from the event tables in which we are interested, sort the events on player/time and run them through some code that associates the data, such as custom reducer. Make a simplified model that we can run in SQL. We want to avoid the first option because we want our game developers to build fun things in the game, not add tracking code. The second option always feels a bit inefficient in the daily processing, we store the events with one table per event and immediately follow up with many different queries that put them back in the order they happened with different constellations of events and you can only see that data when the daily batch has run. The third option is not always possible. With RBEA, data scientists should be able to make the analysis in real-time that previously was only possible with custom reducers (or other tedious ways of creating event associations) on the already stored events. In practice this means that RBEA should support connecting events in time and storing contextual information for the events in a scalable way, while providing results directly from the live streams. The final product should be accessible to the game teams across King with easy-to-use web interfaces similarly to the systems we currently have in place for real-time aggregations. RBEA is a platform designed to make large-scale complex streaming analytics accessible for everyone at King. 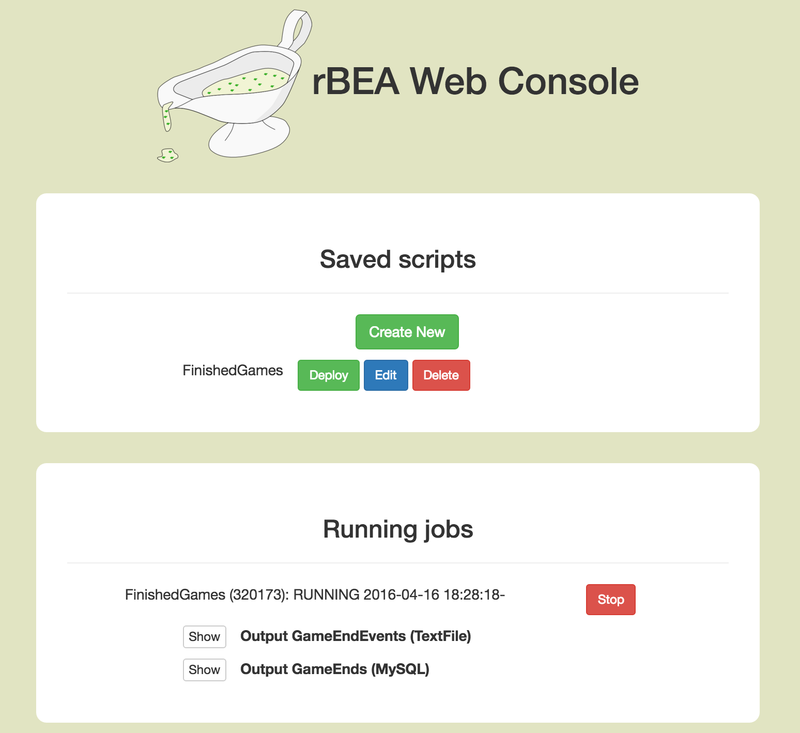 We designed RBEA in a way that users can, with a few clicks, deploy Groovy scripts through a simple web interface and get instant results without worrying about the details of the deployment. This architecture relieves data analysts from the burden of managing large streaming clusters and deployments so they can focus on their application logic for maximal productivity. RBEA scripts run on King’s production Flink cluster delivering real-time results from the live event streams. Using RBEA, developers get easy access to wide range of stream analytics tools such as defining and updating user states, writing output to many different output formats or creating global aggregators across all the users. The RBEA API was developed to make everyday stream analytics tasks easy to write without any knowledge of the underlying streaming engine while still achieving good performance at scale. Cool, this looks super simple so let’s actually see what is going on in this script before going any further. Most of the things are self-explanatory: we defined a processEvent method that will receive the live events one-by-one. We get hold of the output object from the context and also create a counter called GameEnds with a window size of 1 minute (i.e., 60,000 milliseconds). For every incoming event we check whether this is a game end, and if so, we increment the counter and write the event to a text file named GameEndEvents. Now we can save our script as FinishedGames and click the Deploy button. 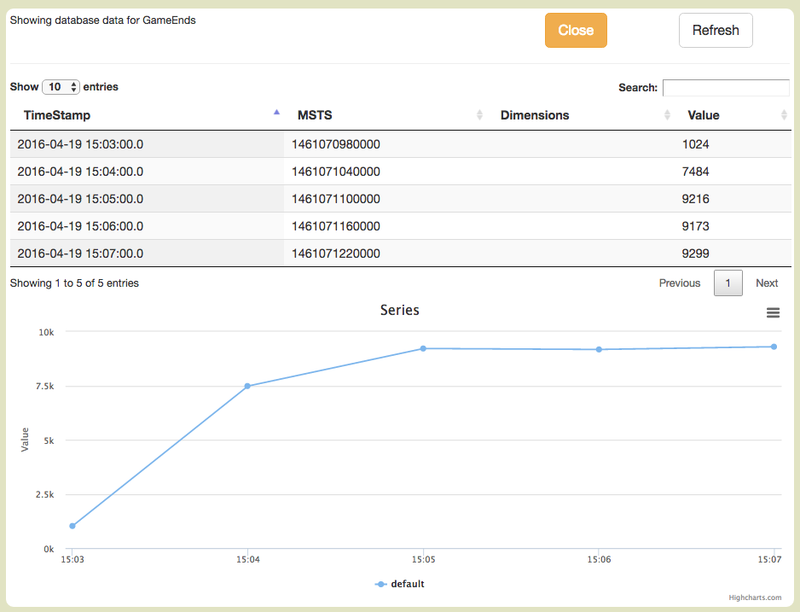 The output of our job is accessible using the buttons that will quickly appear under our deployment: In this case RBEA created a convenient MySQL table for our aggregator output that we can easily access by clicking the Show button for some instant data exploration: The game end events written to the text file can also be accessed as expected and downloaded on demand from the servers. Update function: Defines how the Field will be updated for each incoming event. The update function comes in two flavors: (State, Event) -> State and (Context, Event) -> State. Let’s look at these stages one-by-one. The live event streams are read from Kafka with a modified Flink Kafka Consumer that tags events with the topic from where they are coming. This is important for us so users can freely decide what Kafka topics they want to listen to when running their scripts. We create a KeyedStream from our event stream keyed by the user id. Groovy scripts are received in text format from the web frontend through Kafka as simple events, and are parsed into to the appropriate Java EventProcessor interface. New scripts are hot-deployed inside the already running Flink job as described in the next section. When the operator receives a new event it retrieves the current user state from the state backend, updates the states, then executes all the scripts that listen to the current topic. We are using the RocksDB state backend to persist our states, making sure it scales to our needs. During script execution most calls to the API methods are translated directly into output elements which are collected on the output collector. For example, when the user calls output.writeToFile(fileName, myData) in their script, the Flink operator emits an output that encodes the necessary information that our sinks will need to write the user data into the appropriate output format. Different types of API calls (Aggregators, MySQL output, Kafka output, and so on) will, of course, result in different output information but they always contain the information that is enough for downstream operators to know how to deal with them. The operator also produces some information on the currently deployed processors, such as notification on failures. This is used for removing faulty scripts from all the subtasks and also to report the error back to the frontend so that users can easily fix their scripts. The CoFlatMap operator at the end produces three main types of output: data output, aggregation, and job information. Now that we have this, we simply do a window reduce operation to sum the aggregator values in each window and send it to the correct output. There is one operator for each output format that will write the received events using the metadata attached to them. These operators are not actually sinks in the Flink topology as they will have to produce some information for the web frontend so that it can show the generated output to the user. For instance when the File sink (flatmap) receives the first record to a new output file it outputs some meta-information for the web frontend so that it can display this file for the user for the running script. We have reached the end of our short story on RBEA. We hope you enjoyed learning about this cool piece of technology as much as we enjoy developing and using it. Our goal with RBEA was to build a tool for our data scientists that can be used to do complex event processing on the live streams, easily, without having to worry about any operational details. We believe that we achieved this goal in an elegant and maintainable way by using open-source technologies for all parts of the system. We developed a DSL that is easy to use without any previous knowledge in distributed stream processing making RBEA accessible to developers across King. RBEA scripts are managed and executed in a novel runtime approach where events and script deployments are handled by single stream processing job that takes care of both processing (script execution) and the life-cycle management of the deployed scripts. We are impressed that Apache Flink™ has reached to a point of maturity where it can serve the needs of such a complex application almost out-of-the box. If you feel that something was unclear or you simply want to learn more about the system and the specific design choices we made, feel free to reach out to us! Gyula is a Data Warehouse Engineer in the Streaming Platform team at King, working hard on shaping the future of real-time data processing. This includes researching, developing and sharing awesome streaming technologies. Gyula grew up in Budapest where he first started working on distributed stream processing and later became a core contributor to the Apache Flink™ project. Among his everyday funs and challenges, you find endless video game battles, super spicy foods and thinking about stupid bugs at night. Mattias is a Data Scientist in the Streaming Platform team at King, works with almost all kind of data related projects be it data modeling, ab-tests, segmentation, notebooks, building ETL, setting up databases, scripting and lately java programming. Loves video games and Kings puzzle games and have designed a few levels in Candy Crush and Candy Crush Soda saga.